Hazel Dawn (March 23, 1891, Ogden, Utah – August 28, 1988, New York, New York) was a stage, film and television actress. She was born as Hazel Tout to a Mormon family. Dawn was a member of the original Ziegfeld Follies in 1907. She went to Wales with her family at the age of eight when her father served as a Mormon missionary there. Dawn studied violin and voice in London, England, Paris, France, and Munich, Germany. She was especially impressed by the attentiveness of teachers she studied under in Paris. Her sister, Nancy Tout, was an opera singer and went on to sing with the Opera Comique in Paris. She met producer Ivan Caryll at a party in London. Caryll suggested the name Hazel Dawn, considering Tout to be impossible. Dawn met composer Paul Rubens who offered her a part in Dear Little Denmark at the Prince of Wales Theatre (1909), where she made her theatrical début. She then starred in The Balkan Princess in 1910 as Olga. She achieved a great success with her performance in Ivan Caryll's The Pink Lady (1911). The show ran for a year on Broadway and then toured, making Dawn famous, even though she was not the leading lady. In the production she introduced My Beautiful Lady, which she sang and played on her violin. Subsequently she was known as "The Pink Lady" and the cocktail may have been named for her. The Little Cafe (1913) was produced by the New Amsterdam Theatre and adapted from a book by C.M.S. McLellan. One reviewer found the play lacking when compared to The Pink Lady, but he enjoyed the song, Just Because It's You. Dawn performed it in the third act. He wrote: Dawn was radiantly beautiful and sang far better than did other members of the cast. The Little Cafe was a place in Paris where large crowds assembled to admire the renowned beauty of the owner's daughter. She starred in the operetta, The Debutante (1914), at the National Theater in Washington, D.C., Under the management of John C. Fisher. Harry B. Smith penned the book and play adaptation. The setting of the operetta is in London and Paris, with Dawn depicting a young American girl who is pursued by a nobleman, who desires her fortune. She plays the violin during a scene where she runs away to Paris and makes her musical debut before an appreciative audience. In December she appeared in The Debutante at the Knickerbocker Theatre. She continued performing for Ziegfeld until 1927, when she married. She made her screen debut as Kate Shipley in One of Our Girls (1914). Her association with Famous Players-Lasky film company dated from this movie. 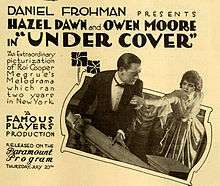 Dawn followed this role with others in Niobe (1915), Clarissa (1915), and The Masqueraders (1915). Niobe is the screen version of a play written by Harry and Edward S. Paulton. She made The Fatal Card (1915) with Paramount Pictures. In My Lady Incog (1916) Dawn played a female detective in a motion picture that is a mystery film, comedy, and a romance. Playing the character Nell Carroll, she co-starred with George Majeroni. In The Lone Wolf (1917) she acts with Bert Lytell in an adaptation of a novel by Louis Joseph Vance. Producer Herbert Brenon was responsible for the picturization of the drama from the book. Hazel Dawn made a claim for $4,643 against the London Theatre Company which filed for bankruptcy in August 1915. The company, which produced and staged plays, was located at 1476 Broadway. Hazel Dawn was once the mascot of both the U.S. Military Academy and the U.S. Naval Academy at one of their annual football games. At one point West Point cadets tossed their hats onto the stage, one of them belonging to future U.S. President Dwight D. Eisenhower. In 1927 she married Montana mining engineer, Edward Gruwell, reputedly one of the richest men in the western United States. They had two children. Afterwards she gave up her career aside from an appearance on stage in Wonder Boy (1931). Following Gruwell's death in 1941, Dawn worked in the casting department of J. Walter Thompson advertising agency. She retired in 1963. Hazel Dawn died at the home of her daughter in Manhattan in 1988, aged 97. She was survived by her daughter, Dawn Gruwell Kaufman, and a son, Charles E. Gruwell, both of whom resided in New York City. Actress Ruth Gordon cited Dawn as her own inspiration for becoming an actress. Ironically, Gordon, who was five years younger, predeceased Dawn, dying in 1985. A 14-year-old Adele Astaire, sister of Fred, saw Dawn's performance in The Pink Lady and idolized her, thinking her to be "the most lovely, graceful creature" she had ever seen. ↑ Joseph F. Clarke (1977). Pseudonyms. BCA. p. 48. "Hazel Dawn, Who Smiled Her Way to Fame, Soon to Appear in Another Play". Lincoln Daily Star. January 2, 1916. p. 31. "Stage and Screen". Mansfield, Ohio News. December 10, 1917. p. 4. "American Gilrs In Paris". New York Times. March 19, 1911. p. X2. "The Little Cafe Has Big Hit Song". New York Times. November 11, 1913. p. 13. "Debutante In September". New York Times. June 28, 1914. p. X9. "London Theatre Co. Fails". New York Times. August 27, 1915. p. 9. "Hazel Dawn, Stage Actress, Is Dead at 98". New York Times. August 31, 1988. p. D21. "Hazel Dawn's Portrayal Of Detective In My Lady Incog Very Clever". Woodland, California Democrat. August 30, 1916. p. 6. Wikimedia Commons has media related to Hazel Dawn.